The Virupaksha or the Pampapathi temple is the main center of pilgrimage at Hampi which was the last capital of the last great Hindu Kingdom of Vijayanagar (14th century. ) 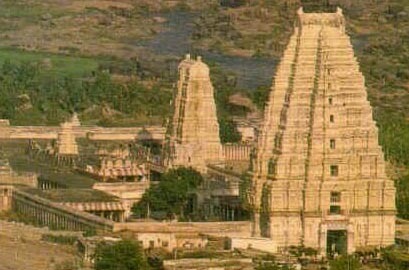 Hampi is situated at 74 kms from the city Bellary and 13 km from Hospet city in Karnataka. Places of interest in Hampi are Virupaksha temple , Vittala Temple,Sule Bazar,Achutaraya Temple,Purandaradasa Mandapa,Royal Center that has Lotus Mahal, the queen's bath and Elephant stables ... Virupaksha temple is in ruins but is still in worship and is dedicated to Lord Shiva. The temple has a 50 m tall, elaborately carved gateway and has been renovated in 1510 by Krishnadeva Raya. The hall leading to the sanctorum has finely carved columns of animals and the ceiling is painted with scenes from mythology. Huge pillared halls are the special and distinctive feature of this temple.